A patch was recently checked into the Mozilla codebase that marks bug 327181 “Improve error reporting for invalid-certificate errors” as Resolved Fixed. 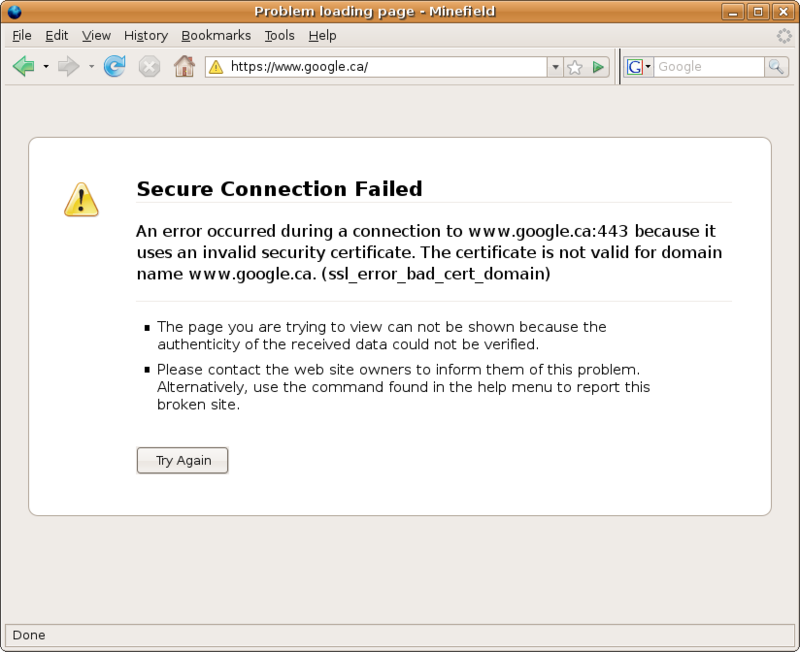 This bug significantly changes the way Mozilla will handle invalid certificates and as a result will hopefully make RMD redundant so earlier today I played around with a nightly build of Firefox 3.0 alpha (Minefield). My impression? I think the changes, while still rough around the edges, do a pretty good job of appeasing the various sides in the bad certificate handling saga. For current users of RMD I think it would be helpful to get your impressions of the changes and so I put together a little screencast of the new functionality in action. I encourage you to take a look and provide Mozilla with your feedback. Even better would be to download a recent build of Minefield and try it out for yourself. Watch the overriding invalid certs screencast. 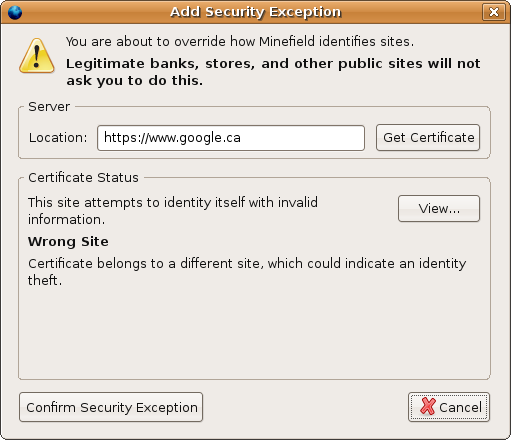 I am not sure what Minefield is, but it seems a very apt name for something that identifies sites. The sentance “Legitimate banks, stores, and other public sites…” is likely to make people’s blood boil. Misuse of the security model is rampant, so much so that trying to claim something about its results is a bit fraught. (Minefield is the ‘code-name’ for Firefox 3). I think that it’s very different to add an exception before the connection than to remeber a setting as in the RMD method. If i could choose I prefer the RMD method, asking for a fix and saving for the future. Is it strange that I got this error page for gmail and facebook? As far as I can tell, they are as public as sites get. There is no immediately obvious way to view the offending certificate. This is bad. I want to see it and figure out what’s wrong with it before I add an exception! Can I just say that whatever Firefox did to this version is driving me crazy enough to resort to going back to using IE. I am getting these secure connection errors on just about every site I use, including Yahoo. If I override it, it works for that time, but the next time I go back..I have to do it again?? Seriously, who has that kind of time. They’d better find something to do with this version or I’m dumping it.